You know it’s time for the holidays when grocery stores start stocking eggnog. And for the vegans and lactose-intolerant among us, there are more options than ever before for dairy-free eggnogs. Sure, you could make your own vegan eggnog at home, but picking up a carton of pre-made eggnog is much more convenient. So for the times you have people coming over for the holidays or simply can’t cram any more to-dos onto your list, these dairy-free eggnog brands have got you covered. After conducting an unofficial taste-test, here are our top picks for dairy-free eggnogs you can find at grocery stores. Drink them by themselves or with some booze as an eggnog cocktail! 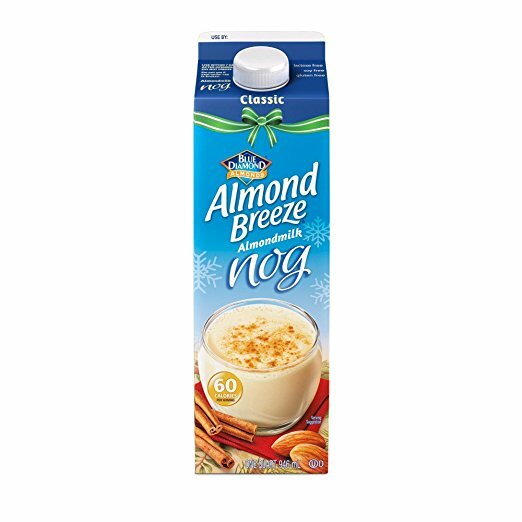 Of all the dairy-free eggnogs we tasted, Blue Diamond’s comes the closest to real eggnog! Unlike other vegan eggnogs that have a watery consistency, Blue Diamond’s almond eggnog is thick and creamy and strikes the perfect balance of sweetness and nuttiness. 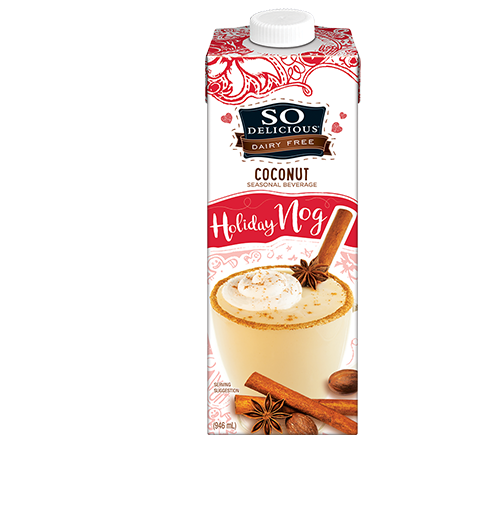 In addition to being free from dairy, this vegan eggnog drink is also free of soy, lactose, cholesterol, casein, peanuts, gluten, eggs and saturated fat. And at only 60 calories per serving with 11g of sugar, it’s way healthier than regular dairy eggnog. 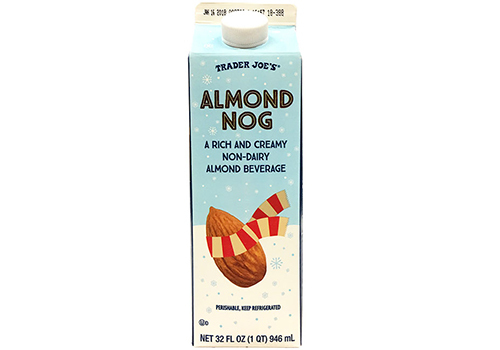 New for 2017, Trader Joe’s Almond Nog has a strong almond flavor with only a dash of sweetness, so it’s definitely more of a beverage and not a dessert. Each serving contains 50 calories and 8g of sugar, and this vegan nog is free of eggs, lactose, dairy, gluten and soy. Clocking in at 90 calories and 15g of sugar, this gluten-free and vegan So Delicious nog is quite rich. It also has a robust nutmeg flavor. 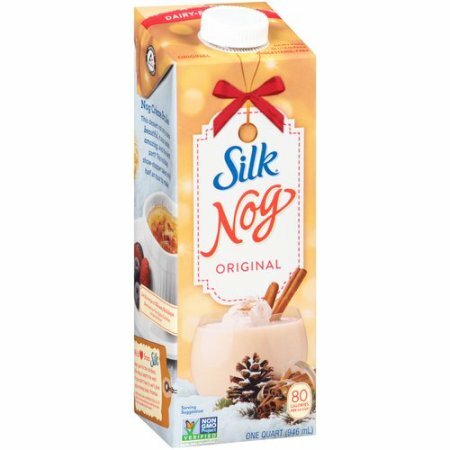 While it has a strong after-taste, if you like soymilk, you’ll probably love Silk’s take on holiday eggnog. At 80 calories per serving with 11g of sugar, it also boasts no artificial flavors or colors and is free of dairy, lactose, gluten, saturated fat and cholesterol. This variety of eggnog from Califa Farms has a strong ginger flavor, which can be good or bad depending on your feelings about the spice. 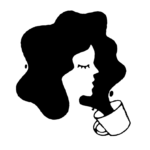 It’s almond milk-based and lightly sweetented, so you can drink a full glass of it and not have to worry about getting a sugar high. Besides being dairy-free, it’s also carrageenan-, soy- and gluten-free with a low 50 calories per serving and 8g of sugar.